There are two places I have found clumps of mandrake (Mandragora autumnalis) or dudaim in bloom, Neot Kedumim, the Biblical Landscape Reserve and Khirbet Midras; they can also be found at the Jerusalem Botanical Gardens in the Mediterranean section, blooming in December/January. Mandrakes are mentioned in two places in the Bible, in Genesis and Song of Songs, suggesting that it is an aphrodisiac. 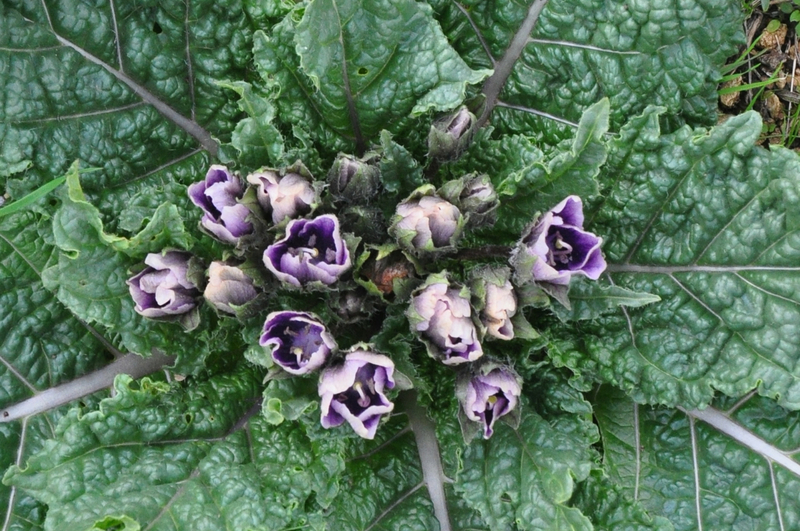 This perennial has a clump of dark green leaves, resembling somewhat the leaves of chard; in the center appear purple flowers. The fruit, orange to red berries, resembling cherry tomatoes, ripen by late summer, at the time of the wheat harvest. The plant has a tap-root (splits into two sometimes) that has a peculiar shape resembling a miniature person. All parts of the mandrake plant are poisonous; it acts as a parasympathetic depressant, hallucinogen, and hypnotic. This post is for Bonna, my life partner and mother of our 5 children – in heartfelt gratitude for 32 years together. In Hebrew the word lev or heart is equal to 32. This entry was posted in Nature, Wildflowers and tagged Mandrake on July 3, 2013 by Shmuel Browns. Hiking w Sumsum in Nahal El Al today and saw a mandrake plant in bloom right by the path (a whole school group including teachers and guides went right by it without noticing).